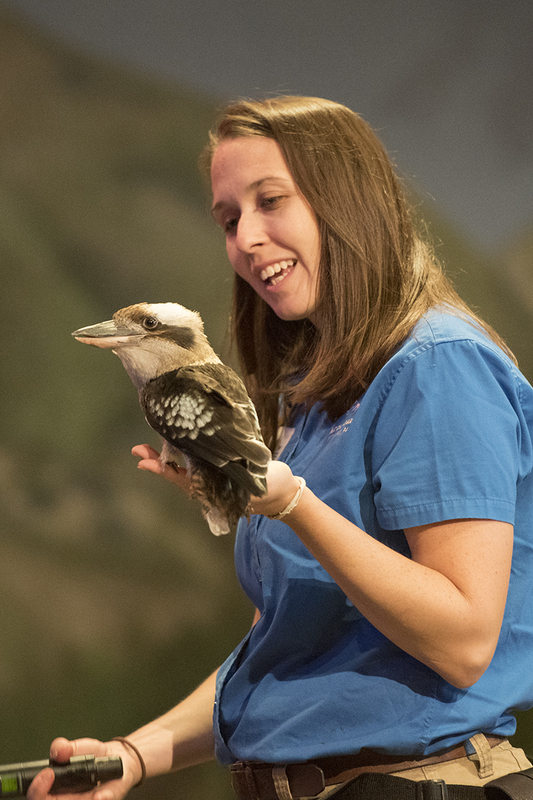 Jenny Walsh ’06 and a laughing kookaburra. I’ve long been fascinated by birds—from the cardinals and chickadees that frequent my backyard feeders to the toucans and hummingbirds I’ve seen on trips to Costa Rica. On a visit to Orlando, Fla., some years back to speak at a magazine conference, I skipped Disney World and instead spent my free time at Discovery Cove, because it has a very cool aviary. But I hadn’t been to the National Aviary in Pittsburgh in many years. And when I found out that a Penn Stater, Cheryl Columbus Tracy ’86, is executive director of the aviary, I decided it was time for a road trip. A few weeks ago I drove to Pittsburgh and got a tour of the place from Cheryl. Wow, has she made an impact there—she’s overseen a major expansion in the past seven years, adding new exhibits, new space for the penguin colony, a FliteZone and a Sky Deck for special shows with live birds, and other features. In the new Grasslands exhibit, I got to see birds I never knew existed: owl finches, Gouldian finches, paradise whydahs, and red bishops, to name a few. Elsewhere I saw one of the aviary’s four Andean condors, part of a breeding program to help restore populations of the endangered bird. I met a beautiful hyacinth macaw named Benito and a couple of strange-looking birds called rhinoceros hornbills. 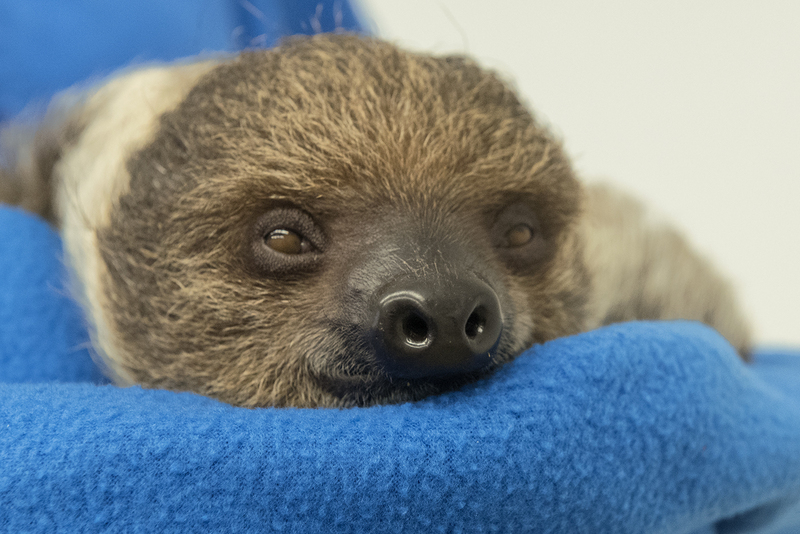 Valentino, the aviary’s enormously popular—and mellow—baby sloth. —Mike Faix ’05, an education trainer, who teaches the birds to perform in the aviary’s shows. —Tammy Carradine Frech ’85, who’s in charge of volunteers and interns. —Teri Danehy Grendzinski ’93, supervisor of animal collections. She’s been at the aviary for 23 years, pretty much ever since she graduated. —Michael Leonard ’04, who does IT for a local law firm and volunteers at the aviary. —Jessie Baird Lehosky ’06, events manager. She handles weddings and other events that take place at the aviary. —Jenny Walsh ’06, assistant manager of behavioral management and education. I shot the short video clip below with Tammy Frech, who’s holding a scarlet macaw named Red. As you’ll see, Red can speak on command—when he’s not busy eating a treat. You can read more about my aviary visit in the September/October issue of the magazine, and you can see a handful of additional photos from the aviary visit on my Flickr page. Entry filed under: Alumni, Around the Commonwealth, From the Magazine. Tags: "National Aviary", Pittsburgh, sloths.